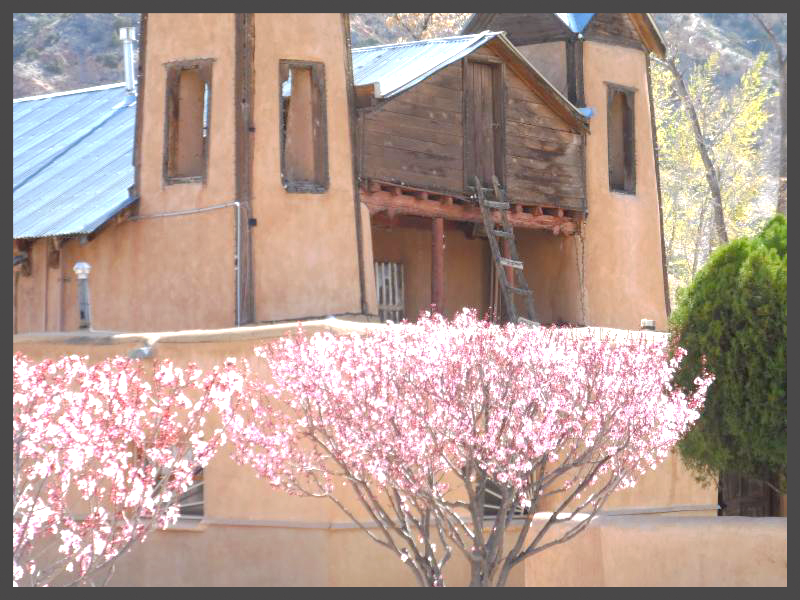 The Pilgrimage to Chimayo dates back to the construction of the Santuario of Chimayo in the early 1800s and usually occurs during Holy Week. People seeking healing, a blessing or looking for a spiritual experience walk to the Santuario. The route most often taken is from churches in Nambe or Santa Cruz, both of which are about 8 miles from the Santuario. Saint John the Baptist Catholic Church’sHoly Name Society will lead a church sponsored pilgrimage on Saturday, March 28. The pilgrimages will leave Sacred Heart Catholic Church in Nambe (Hwy NM 503 in Nambe) at 7:00 a.m., with Mass celebrated at 11:00 a.m. in Chimayo. For more information call (505) 982-2965.
pilgrimage will leave from Sacred Heart Catholic Church (Hwy NM 503 in Nambe) at 6:00 a.m. on Saturday, March 28, arriving at the Santuario in Chimayó for Mass at 10:00 a.m. The intention for this year’s Pilgrimage is the persecuted church worldwide. For more information call (505) 982-5619. Santa Maria de la Paz’s pilgrimage will leave Sacred Heart Catholic Church in Nambe (Hwy NM 503 in Nambe) at 7:00 a.m. with Mass at 11:00 a.m. in Chimayo. (Please Note: Transportation is available for those parishioners unable to walk. The bus departs from Santa Maria de la Paz at 6:00 a.m. and will follow the procession. Transportation cost is $10.00.) For more information call (505) 473-4200. Archbishop Michael Sheehan will offer an opening prayer at Santa Cruz de la Cañada Catholic Church in Santa Cruz (Hwy 84-285) at 7:00 a.m. The Archbishop will join the procession in Chimayo later in the morning around 11:00 a.m. Please call (505) 831-8100 for additional information.